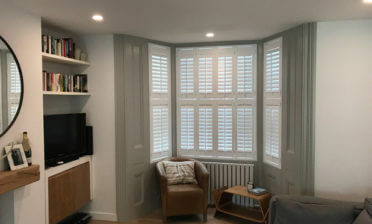 We were in Hampstead in North West London to install some of our custom made shutters for a customer in a terraced Victorian Home. They were looking for a window dressing which would create not only a stylish look to the window and room, but also a flexible solution which is practical throughout the day and night. Tier on Tier shutters are popular with customers who have bay windows. They not only look fantastic, but offer the most versatile solution which can be adjusted in a multitude of different ways depending on the exact lighting and privacy needed. 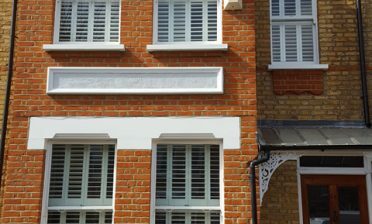 The tier on tier shutters can also be created to fully match the lines of the windows, as we did in this case so that they look great from inside and outside of the property. 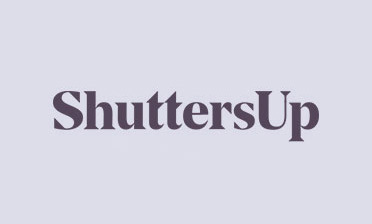 The shutters were created and installed in a way that all panels can open, closed and be adjusted however needed without any of the panels getting in the way. 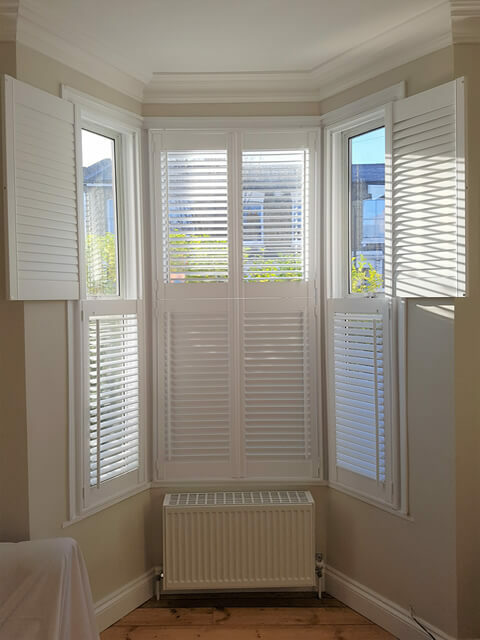 We created the shutters using wood from our Fiji Range and finished them in a lovely pure white paint to match the room and windows behind. We used 8 panels in total featuring 47mm louvres which provided the privacy the client needed, with a larger quantity of louvres able to fit on each panel. The louvres can be adjusted using offset tilt rods which have been placed on left and right sides to be perfectly symmetrical. These tilt rods also create a stylish yet traditional look, perfect for a Victorian era property.